Modular Driven Technology (MDT) has created a new 6061-T6 aluminum chassis for Rem 700 actions (and Rem 700 clones). MDT’s new TAC21 chassis has four (4) main components: action housing, lower unit (with trigger guard and mag well), forearm, and a quick-detach buttstock adapter that mates with the action housing. The main section has a +20 MOA milspec Picatinny rail on top. The action is seated on a V-Block style base inside the action housing. 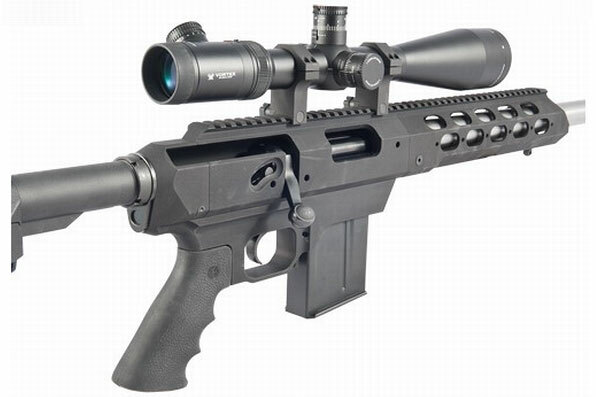 The short action TAC 21 chassis employs AICS-style magazines for .223 Rem or .308 Win-sized cartridges. The fore-end/handguard allows for free-floating barrels up to 1.350″ diameter. The chassis is built to accept any AR15/M16 stock and pistol grip. Currently Sinclair Int’l is the exclusive USA distributor of MDT’s TAC21 chassis. Sinclair’s price for the short-action version (right-hand or left-hand) is $849.99, while the long-action version will be $942.99. At present, only short action-versions are in stock, but MDT will be making long-action versions soon, and Sinclair is taking pre-orders. NOTE: these prices do NOT include buttstock, barrel, action, trigger, or optics. For more information, visit www.mdttac.com. Al Voth from the Coyote School Blog did a field test of a .204 Ruger rifle built with the TAC21 chassis and conventional wood buttstock. Voth was able to assemble the rifle in 40 minutes with the MDT chassis kit and “everything fit perfectly.” CLICK HERE to Read Coyote School TAC21 Review. 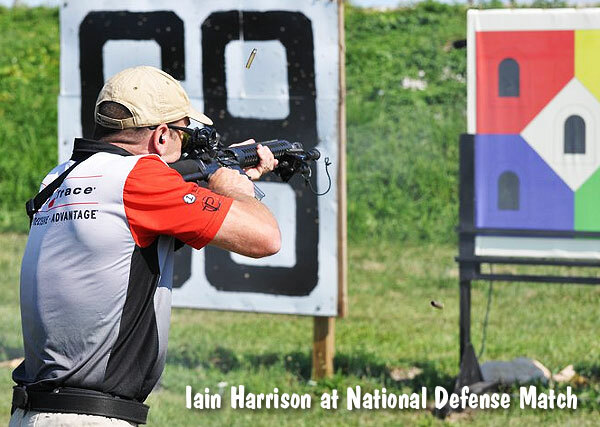 Share the post "MDT Offers New TAC21 Chassis for Rem 700 Actions"
Iain Harrison of “Top Shot” fame won the inaugural National Defense Match at Camp Perry this weekend. This is a new practical/tactical match designed to mimic real-world training and tactics. Marking a departure from the usual Camp Perry matches, scores are based on both time and accuracy as shooters engage targets positioned at 7, 15, 30, 60, 100, 200, 300, 400 and 500 yards. 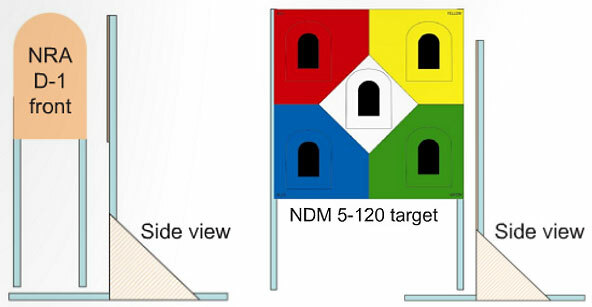 The 5-zone NDM5-120 target is used out to 30 yards, while the NRA D-1 Tomestone target is used at 60 yards and beyond. The event is open to AR15s, FN SCARs and other modern defensive rifles with either iron sights or optics. There are three classes: Tactical Limited, Tactical Optic, and Open. The first two classes are limited to 20″ barrels with 4.5-lb or greater triggers. Open guns may have longer barrels, lighter triggers, bipods, and multiple sighting systems. CLICK HERE for Nat’l Defense Match Guidebook. Harrison, who now works as marketing manager for Crimson Trace, showed the skills that made him the Season 1 “Top Shot” Champion. In a neck and neck race with Team FNH’s Tommy Thacker, the two shot almost identical times during the first half of the match, until Thacker made a procedural error. That gave Harrison the edge he needed to win. Also joining Harrison for the event was fellow Top Shot finalist and Ohio native Chris Cerino. Share the post "New Defensive-Oriented Rifle Match Debuts at Camp Perry"